GroomingLounge.com, the nation’s premier resource for men’s grooming products and advice, set out to determine which U.S. city was currently home to the country’s most handsome men. “We’re in the business of making men more handsome and as we grow, it’s important for us to keep abreast of how men throughout the country prioritize good grooming,” said GroomingLounge.com Founder and CEO Mike Gilman. While handsomeness may be subjective, the criteria in this survey measure the men in each city’s commitment to appearance. GroomingLounge.com based the findings on the following criteria: amount spent on personal care services per man, spend on personal care products per man, spend on shaving needs per man, spend on apparel per man and the fittest cities in the nation. This is the second incarnation of the Most Handsome Cities List. Compared to 2015 results, only the top two spots remained the same. What’s changed? 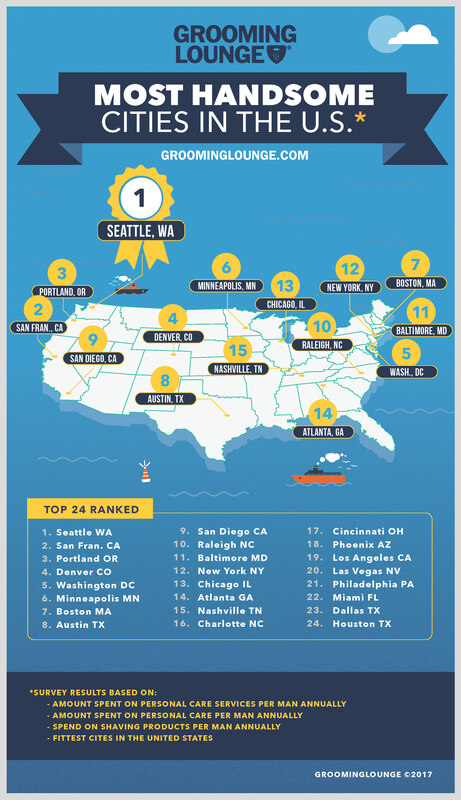 Portland beat out DC for the third spot. New York and Boston both fell a few spots while Minneapolis moved up and Raleigh makes its first appearance on the list. Grooming Lounge found that men in Seattle spent the most, approximately $682 on personal care items and services annually, while men in Miami spent only $472. Despite being the fittest city in the nation, the average guy in DC spent less on the clothes that make the man since 2015, bringing the nation’s capital down to the number 5 spot. Grooming Lounge is the country’s premiere destination for upscale men’s grooming products, services and advice. Open 24/7 worldwide at www.groominglounge.com, the company also has iconic Barbershop & Spa locations exclusively for men in Washington, DC, Northern, VA, and soon Dubai, UAE, with franchise opportunities open nationwide and its own line of custom-formulated Men’s Grooming Solutions.